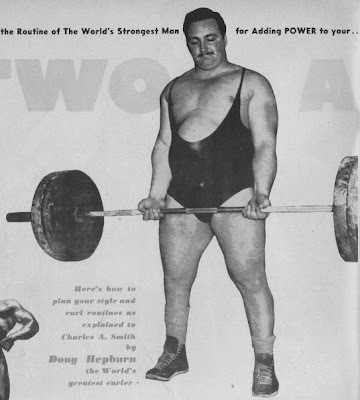 “If you have thoroughly grasped the principles back of my power workouts for the curl,” went on Doug in his very lengthy letter, “you will see that for maximum performance there are certain factors to be taken into consideration. First, the type of curling and second, the type of schedule you will use. Style entails not only strict adherence to the rules for the lift, but also posture, contraction of muscle groups other than the biceps during the actual curl, breathing, and leverage on the wrists and hands. In the choice of schedule, your physical type also has to be considered, plus a good choice of training poundage. Perhaps the average weight trainer might think that too much attention is being paid to what appear to be unimportant details, but to reach the top in any sport or endeavor each and every item that makes for maximum performance must not be overlooked. It is utterly useless to undertake specialized training and engage only in exercises. In other words, if you are trying to improve your ability in say, swimming a certain distance, you should realize that the mere act of swimming isn’t sufficient to bring your performance up to a peak. You must also consider faults in style, and work for absolute style perfection and efficiency. You must think of diet, rest, relaxation and correct mental attitude. You must think of any other activity that will improve your stamina and swimming strength and engage in it. In short, to reach the top in any field you have to be a PERFECTIONIST, and DETERMINED. First, let us talk about what I have always maintained is the most important factor in building power in your curls – FORM and STYLE. Now, in recent years there has been a trend, worldwide in its nature, to abandoning the traditional importance of strictness in style or form. Before I go any further, don’t get me wrong! This is NOT a condemnation of cheating methods of exercising, for those occupy an important place in weight training. I have personally discovered that there is positively no other method – as far as I am concerned – of building the type of curl power essential for the raising of great poundages, like the maintenance of strictest possible style. The use of cheating curls builds size and gets the lifter accustomed to handling heavy poundages. But in competition curling, you are bound by a set of rules, and I see no reason why you should depart from those rules when you are training. Get used to the strict style when you are practicing and it becomes second nature for you to KEEP TO A STRICT STYLE when you are trying to break your records . . . That’s logical! Getting back to the cheating curl once more. This has proven itself to be invaluable, as I have mentioned before, in molding bulk and building the ability to handle greater poundages, BUT it is interesting it is both interesting as well as significant, when one can observe for himself that sheer curling power was displayed to a greater degree, per size of individual, in the smaller-ratioed arms of strong men of past eras. 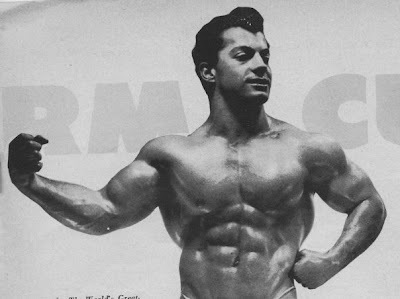 Now this is an extremely important observation for it tends to show, among other things, that greater power in the curl was developed by men who throughout their curl training maintained more correctness of form. Now I’m not saying that a loose form does not produce strong muscle, for anyone with the slightest knowledge of kinesiology knows that either a muscle works or it doesn’t. What I am getting at is this – that strict adherence to both strict and cheating training methods would produce higher poundages. Cheating methods are deviations from competition form and bad habits most often get worse instead of better. Therefore, a combination of loose and orthodox methods is better from the standpoint of all-around efficiency. The difference in power between the old-time strong men and the present-day larger armed bodybuilders is thus seen to be no mere coincidence. I would like to elaborate on this a little. The most difficult part of the curl is the start – getting it away from the thighs to where the forearms are level with the ground. During this part of the curl, and before the main muscle group is brought into play, the main effort is brought to bear on the tendons and ligaments in the elbow joint . . . please remember that I am speaking from my own personal experiences. In the cheating curl it is the starting point that is essentially eliminated. Hence no great demand is made on an initial powerful contraction of the muscle and no demand is made on those heavy cords attached to the elbow joint. Thus the old-timer was able to produce a powerful start to his curl and finish the lift, even though sometimes great with difficulty when he was at his limit. The modern bodybuilder hasn’t the power in that initial movement although his biceps are able to handle enormous weights, from where the forearm is just above level to the floor, to the shoulder. In performing power curls I proceed as follows. When I step up to the bar, I first make sure that all the plates are flush against each other. The slightest “off balance” and one arm lags behind the other, and that’s cause for disqualification. Then I take up my stand before the bar, shifting my heels and toes until I feel absolutely comfortable. Next I take my grip – again paying attention to the correctness of hand spacing, making sure the hands are absolutely equidistant. Again the choice of hand spacing can mean failure or success in a lift. When I lift the bar, I stand perfectly erect and try to allow as little tension in the elbow joint as possible. I stand perfectly relaxed. I do not believe in psyching myself up to what is termed a “pitch” because I am of the opinion that this is a drain on nervous energy and detrimental to curling success. Thus I am assured of perfect conditions for curling, in an initial contraction. Please, note that the arms should not be bent in the least prior to the commencement of the lift. As I start to curl, I bend my hands at the wrists, turning them up on the joint and again assuring a “break” in adverse leverage at the start of the curl. Immediately the bar starts away from the thighs, I firmly contract the buttocks, the thighs, the back and the latissimus dorsi muscles. I keep this rigid posture throughout the entire lift (under official conditions, the slightest back bend is cause for disqualification). Again, as the bar leaves the thighs I take a deep breath. I have found that to take a deep breath before the lift is commenced prevents a smooth curling motion. In other words, the action of deep breathing spontaneously with the action of curling helps to “lift” the weight up more smoothly. Throughout the lift I look straight to the front and as the barbell arrives in at the finish position I breathe out and straighten out the wrists. If you keep the wrists bent you will find when handling heavy poundages that the bar pulls o the thumbs, and may even fall out of your grip. So straighten out the wrists from their flexed position at the start of the curl. Remember that bending the wrists, turning the palm of the hand onto the lower forearm, is done only to break the adverse leverage at the commencement of the curl. Thus the bar comes in comfortably to the shoulders until the referee has signaled you to lower it. One more point, and an important one, is to insure firmness of grip BEFORE you curl. So as well as seeing the plates are flush and the width of hand spacing equal, it is also wise to thoroughly chalk the hands . . . not merely the palms, but also IN BETWEEN THE FINGERS. The routine I have followed in training for my recent curl of 220 pounds at the Mr. Eastern America show is one I have found to be best for maintaining a constant limit poundage and helping to increase it further. I first perform warmup curls with a poundage 30 to 40 pounds below my maximum efficient training weight. In this instance, using strict style I take 160 for 5 repetitions. I then jump from this poundage to my maximum training weight after a short rest of five minutes. During my training for the Eastern America show I was using 185 to 190 pounds. 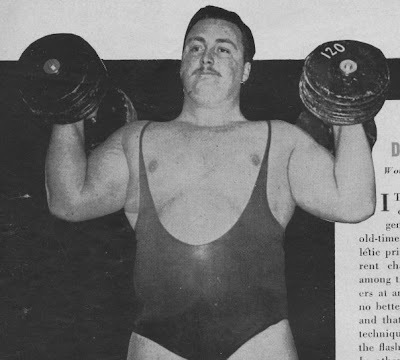 But at the end of December, 1951, I had jumped my training weight up to 190 to 200. With this poundage I perform 5 reps striving to keep the style as strict as possible. I often have a knowledgeable training partner stand by carefully watching to see if I fail to keep correct form as framed by the rules. I perform another 5 reps, again using strict style, but this time for the first 3 reps only, and with a little relaxation the next two reps. I repeat this for about 5 or 6 sets. Sometimes I am forced to drop the strict repetitions down to 2 out of 5 by the time I get to my last set. After a rest of ten minutes I take 160 pounds and conclude the curl workout by performing 10 strict reps. This supplies a change as well as helping me to gain some small level of endurance. I have never used any of the so-called assistance exercises apart from two departures from the orthodox curl. If I feel in need of a change I use the two hands curl with dumbells, but ALWAYS work for the strictest possible form. Sometimes I load up a heavy barbell to 700 to 750 pounds and using a curling grip, deadlift it and let it hang from my arm’s length as if I was about to curl it. In fact, I go through the motions of trying to curl the bar, but all the while I am holding it I allow the arms to take the strain. These two movements, together with the principles outlined both sections of this two-part article should, I think, yield great results for those who conscientiously apply them. They have certainly produced results for me.